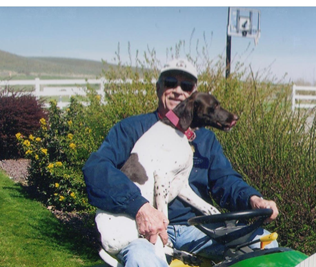 Following my dad’s passing in April 2012, his devoted dog Gretyl, a 9 yr. German Shorthair Pointer came to live with us. Gretyl has been on Showdown her entire life. She went everywhere with my Dad, even on the golf course. Many would always compliment him on her beautiful coat. When hospice came, Gretyl would jump onto the bed and lay right next to my dad. The night he passed she was so upset. I had brought some Relax with me on the plane. I gave Gretyl 10 sprays of Relax and she slept through the rest of the night. I continued to give it to her for the next several days including the day I drove back to southern California as she occupied my back seat. As we turned onto the dirt gravel road leading to my house, her head picked up as she might have thought she was going on a hunting adventure. Upon her decent of the vehicle, she saw a lizard and a zillion rabbits in every direction. Knowing that she was mourning like us, I wanted to keep as much the same as possible for a while until she adjusted to her new home. The Relax and the Dyna Pro were very helpful. Despite feeding her regular program, she had diarrhea every day. My Dad used to tell me how slow Gretyl had gotten, that she was a house dog now and showed lots of signs of arthritis and he was very worried that he might not out live her and who would care for her. When I made the gradual switch to the Dynamite dog food the diarrhea remained. I added additional Showdown, Excel, Ester-C and a little Miracle Clay and it decreased to a soft stool. I found out that Gretyl had something called immune-mediated polyarthritis. It affected all of her joints and caused her to look lame on all fours. It was also the cause of the lack of appetite and the low grade fever she had every day. When Dynamite introduced the Canine TNT I was amazed at how many things had changed for Gretyl. She eats all of her food, has plenty of energy and her stool is totally normal. She gets up and down almost normal. The only problem is coming off the couch you can see the arthritis. The daily fever has diminished. She drags my husband Dave all over our 5 acres sniffing in every hole. We are in the process of fencing our property so she can run. Gretyl had slowed down because my Dad had slowed down. Here with us she has other dogs to play with and room to run and hunt. She transferred dependency to my husband Dave and plays like there is nothing holding her back. She can hardly wait until the fencing is completed and she can just run. I am grateful to God for blessing us with Gretyl and I am so grateful to Dynamite for the many wonderful products that keep our animals well and happy.